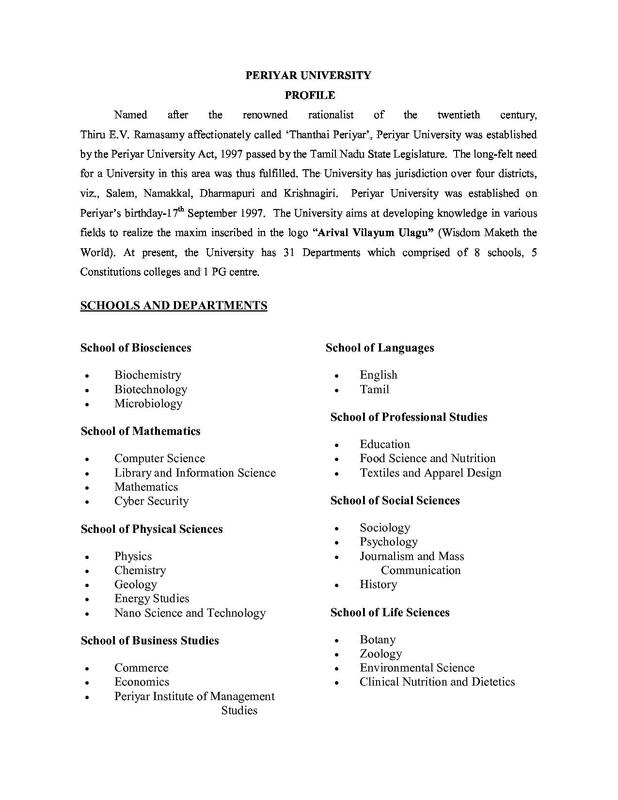 Periyar University was established by the Government of Tamil Nadu in the year 1997. 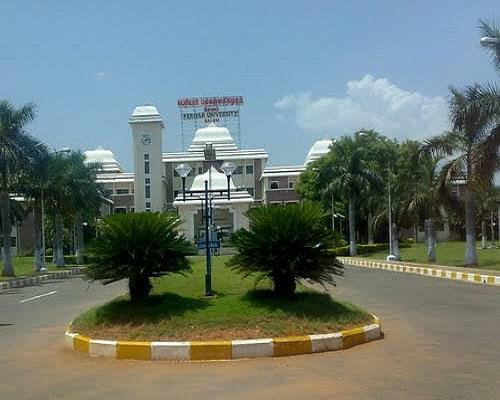 The university is named after a social reformer Thanthai Periyar. Periyar University imparts higher education at three levels, i.e., through its Departments of Study and Research, Periyar Institute of Distance Education (PRIDE) and the Affiliated Colleges. 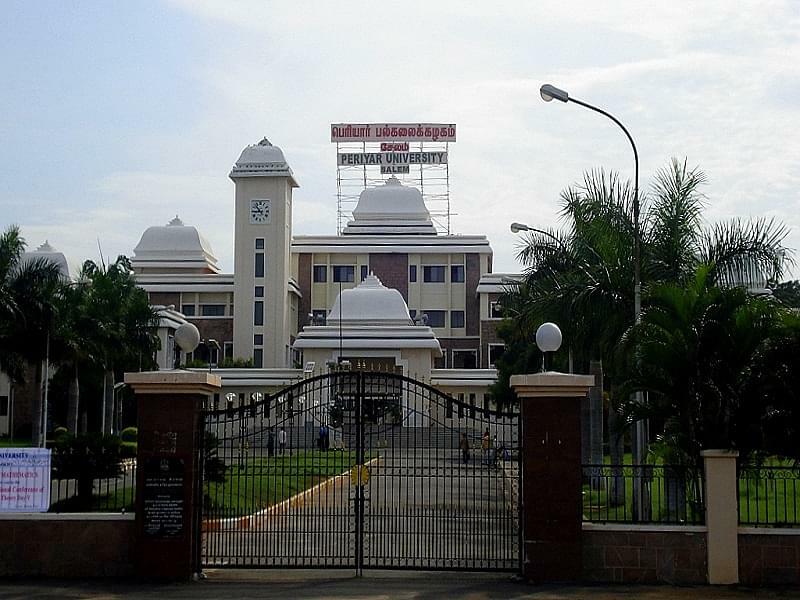 The selection is done on the basis of entrance test namely- TANCET which is conducted by Anna University. The university is recognized by UGC, New Delhi and is accredited by NAAC with A grade. It has 18 departments of study offering Post Graduate and Research Programs. The Choice Based Credit System (CBCS) has been introduced for the various courses offered by the University. The University tie-ups with various academic, research institutes and universities across the world bring laurels to the academia. 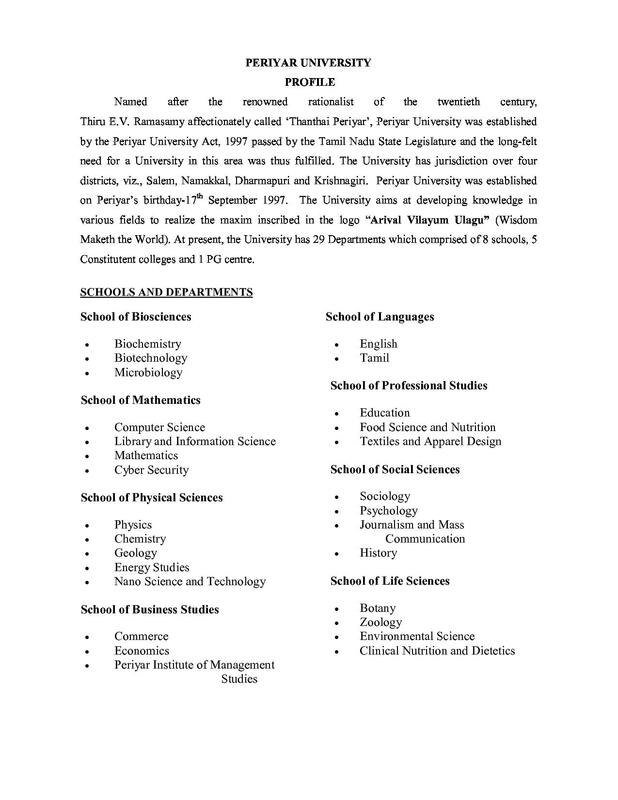 Periyar University offers various PG courses in the field of Science, Arts & Management. The list of postgraduate courses consists of MBA, M.Sc., MA, MCA, M.Com, M.Ed, M.Phil, and certificate courses. The duration of these courses is varied according to the program. 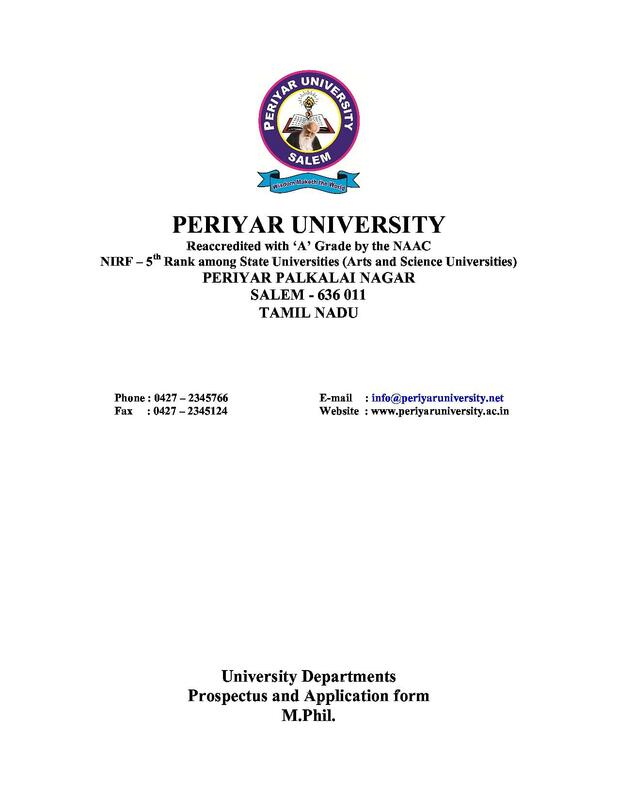 Click here to check Periyar University Fee Structure. The University has five constituents college. 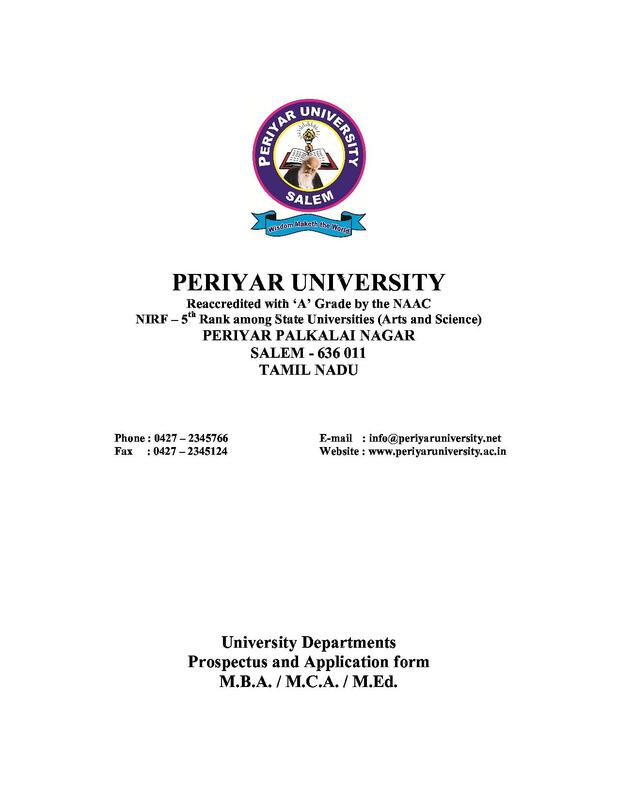 Periyar University Admission is through online mode. Candidates who wish to apply can submit the application form on the official website of university. Applicants are advised to check eligibility before applying for the programs. Those who will successfully qualify the eligibility criteria can only apply for the admission. The selection is done on the basis of merit of last qualifying examination. There are certain courses, students are selected on the basis of entrance test such as TANCET, MAT, CAT. 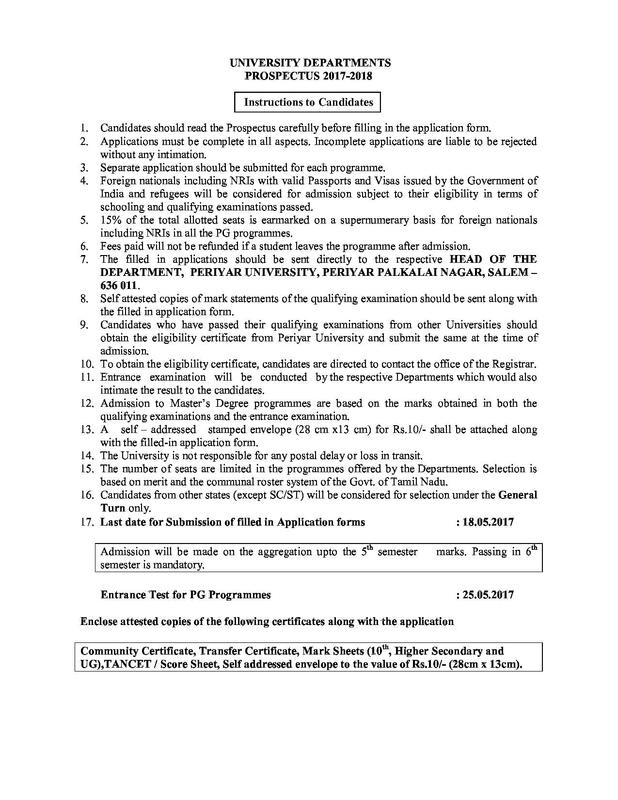 For admission to MBA, MCA, M.Ed. programs, students should have graduation degree with a valid TANCET/ MAT score. 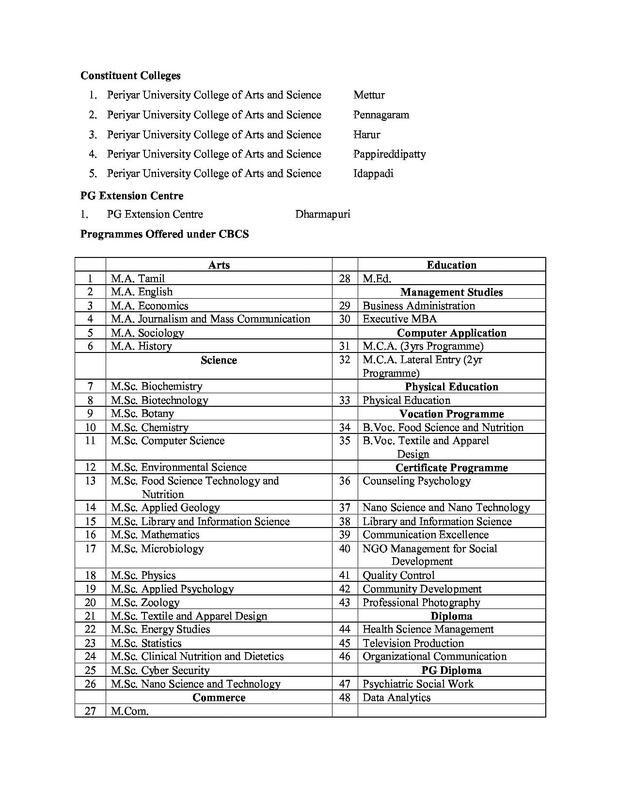 Listed candidates on the basis of their marks are considered for admission. The Periyar Institute of Distance Education (PRIDE) offers various PG courses in the departments of Arts, Commerce, Management & Science. The students admitted to the study centers located in Tamil Nadu, Puducherry & other states can check the examination schedule for December scheme. 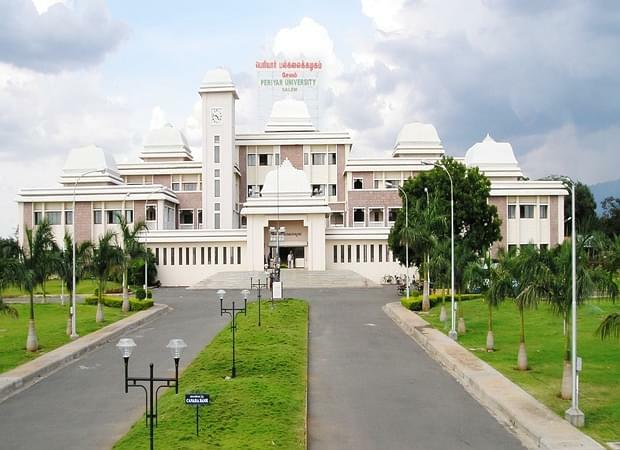 TANCET (Tamil Nadu Common Entrance Test) is a state level exam organized by Anna University. The exam is conducted for admission to various post-graduation courses like M.E., M.Tech, MBA, MCA, M.Arch, and M.Plan. Candidates can fill TANCET 2018 Application Form from the official university website www.annauniv.edu. 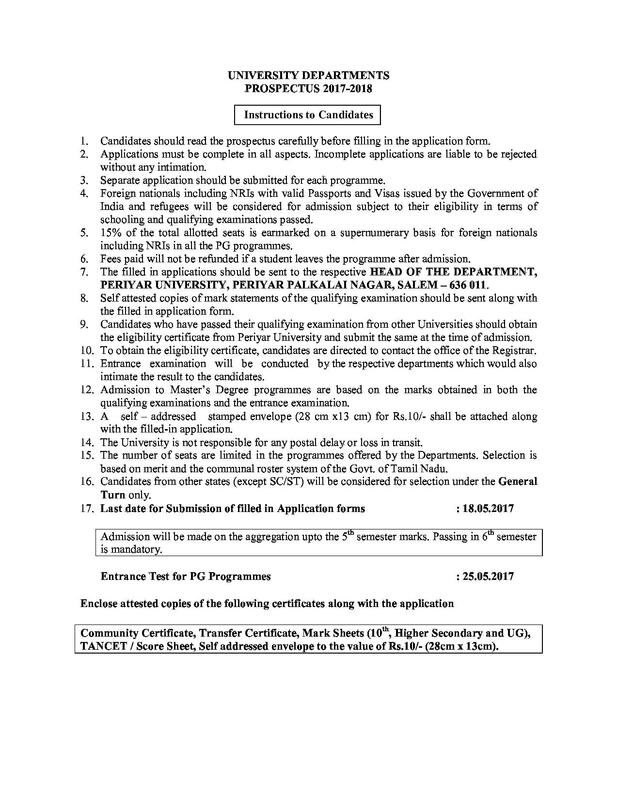 The minimum Eligibility for TANCET is graduation degree with minimum required marks. Click here to know TANCET Exam Pattern in detail. Management Aptitude Test (MAT) is a national level entrance test, held for admissions to MBA/PGDM programs. 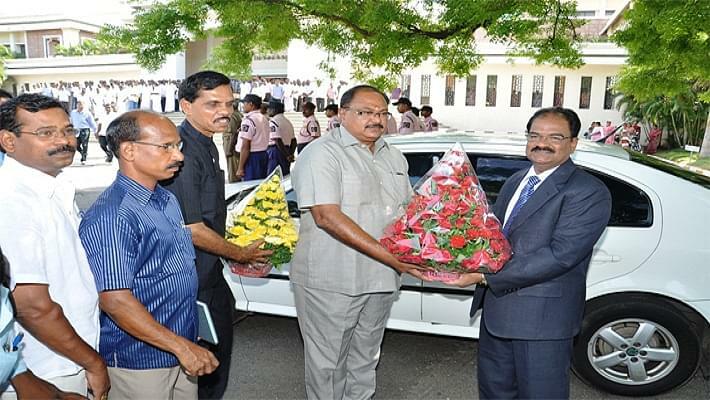 Nearly 600 B- schools in India accept MAT Score. All India Management Association (AIMA) conducts MAT four times a year (February, May, September, and December). As per MAT Eligibility, students must have the graduation degree. It has 75,098 volumes of text and reference books on various disciplines. The library subscribes 203 National and International Journals, 118 Online Journals and 13 leading Newspapers. University Library has 2,309 CDs/DVDs. 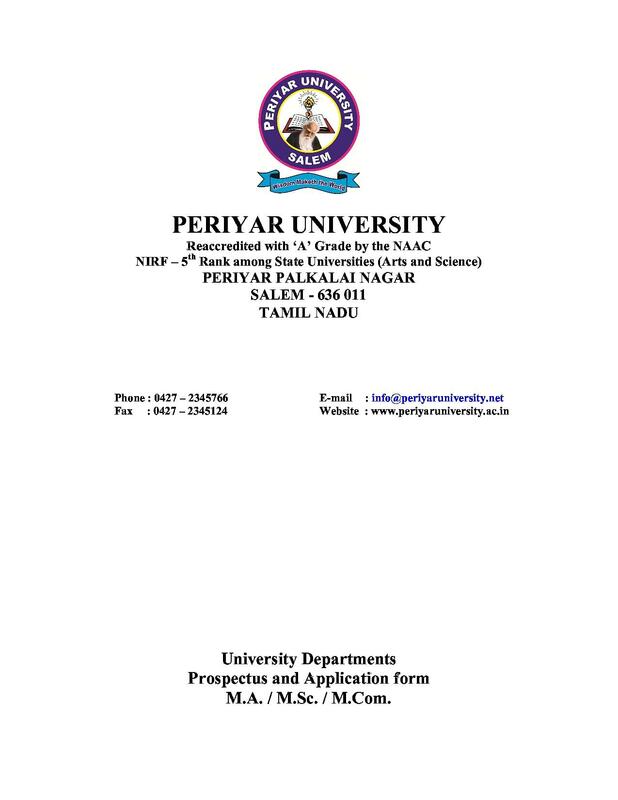 In addition to that, E-Question bank of Periyar University Examinations and E-Thesis of Periyar University are available. The library is following the open access system and provides its service to meet the requirements of P.G. students, M.Phil. and Ph.D. scholars and staff members of the University. 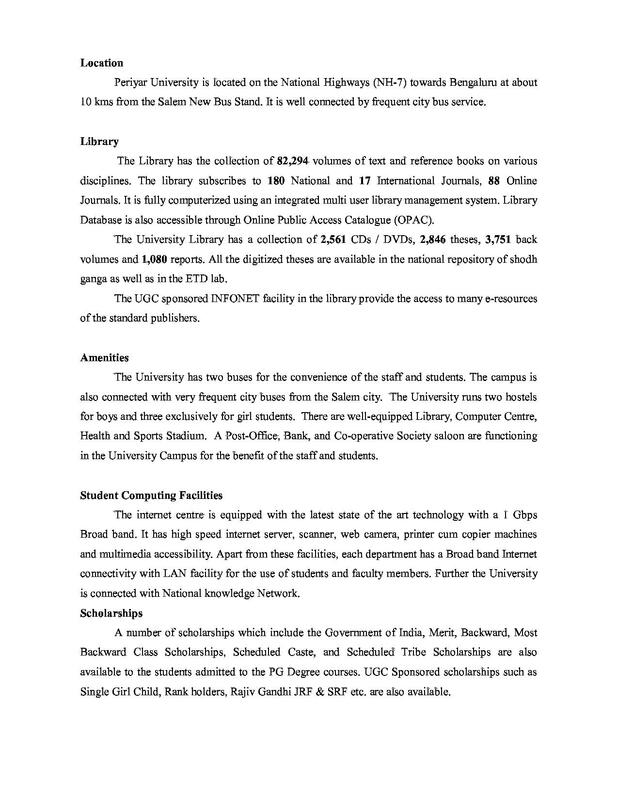 University Library has various sections such as Reference Section, Textbook Section, Books for competitive Examinations etc. The Computer lab contains 61 personal computer systems is used to provide the needs of the students in browsing and electronic mail. The University has launched 1 Gbps Internet connectivity to increase the Internet usage and to promote ICT enabled soft skill program. If i have a talent i will pass the troubles or politics other than studies. Very important in Ph.D. is patients want to have a tolerance capacity and Want to face many diffucilites should not fedup with anything. 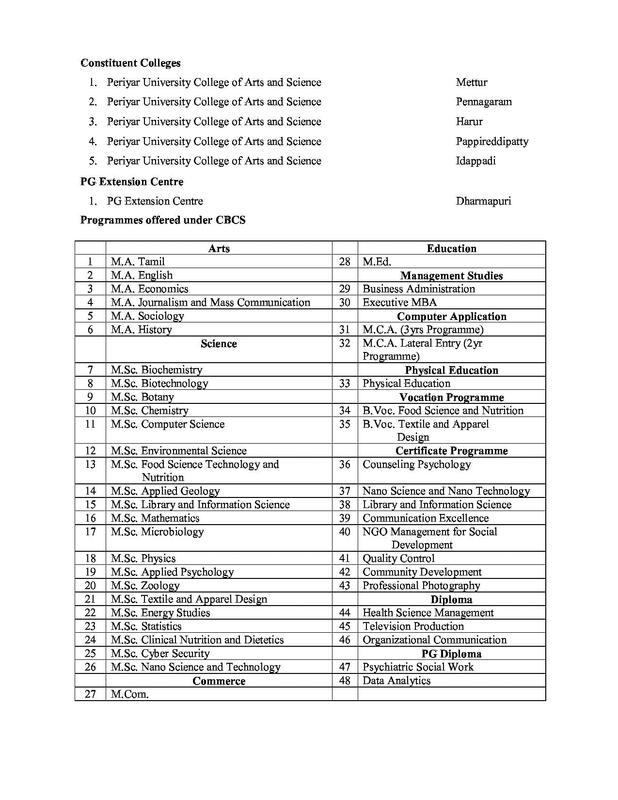 Is campus interview in there for M.Sc microbiology. !